ADDENDUM: This Desire Line has now been made permanent! What we have here is a Desire Line. I walked around the corner last week and saw it freshly painted on the sidewalk. 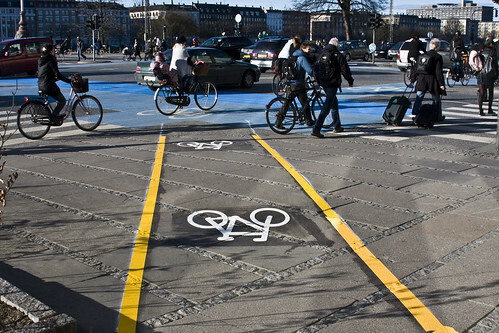 Right at the intersection between the nation's busiest bike street, Nørrebrogade, and the street along The Lakes. Most cyclists will head straight on here, towards the city centre, but many others ride up onto the sidewalk to get to the next street over. They always have. Now, technically, this "sidewalkin'" is illegal but when you have a few thousand people doing it each day you have two options. You can stand there and issue fines until you're blue in the face or you can do what the City of Copenhagen does: respect the peoples' Desire Line - as decided by subconscious democratic consensus - and turn it into a bike lane. The phrase Desire Line, or Desire Path, was coined by the French philosopher Gaston Bachelard in his book The Poetics of Space, from 1958. It describes the human tendency of carving a path between two points. You see them everywhere. Urban planners in, say, a park construct pathways and then a trodden-down path is formed through the grass. This is the route that the users subconsciously desire to walk. It is almost impossible to plan pathways. The people will ulimately decide. I've read that urban planners in some cities visit their parks after it snows, in order to see clearly where people desire to walk. M Bachelard gave it a lovely name, but the streets of most old cities follow the ancient desire lines beaten by people and livestock. I think it lovely that the City of Copenhagen respects these human desires and adjusts the infrastructure to follow our desires. This Desire Line heads from the corner, as above, and along the sidewalk, past that pedestrian interrupting my infrastructure photo, and over to the next street.